Simply having a book published featuring your organization or demonstrating your expertise helps establish credibility in the public’s mind and garners the respect and notice of media. It also creates a multiplicity of ways to differentiate from your competition, launching you, your business, or your organization to levels of success you’ve only dreamed about. Whether your book becomes the cornerstone of your marketing plan, or just a component of it, publishing will give you the competitive edge that is missing from typical campaigns. A professionally published book or booklet can build the good-will and credibility in six to eighteen months that ordinary marketing efforts take five to ten years to build. You will differentiate and will no longer be just another contender offering the same services, benefits, or products as your competition. Published experts get quoted in articles, get media interviews, and get more speaking invitations. Unlike a brochure or an advertisement that gets tossed out, a properly published book has intrinsic value and is kept by your prospects and media contacts, thus validating and extending the impact of your message. It is often proudly displayed in their homes or offices where visitors can read it, therefore providing you with even wider exposure, giving you the additional advantage of a friendly and trustworthy endorsement. We bring over twenty years of experience and 26 national book awards to the table. Our clients' books have been cited, endorsed, and reviewed in hundreds of prominent publications, including The Washington Post, Minneapolis Star Tribune, San Francisco Chronicle, Fitness, Los Angeles Times, Christian Retailing magazine, the Sacramento Bee, and Shape, among others. Our authors have been interviewed on hundreds of stations and have reached millions of people through our marketing and public relations camgaigns. Some of our clients' books are in their third printing and are consistently in the top sellers in their categories. Gain immediate access to our strategic alliances. We operate an established “manuscript-to-bookstore” delivery system. Our accounts include the national bookstore chains, independent bookstores, on-line retailers, and the top national distributors. To view a list of marketing, graphic design, and production services we offer, click here. 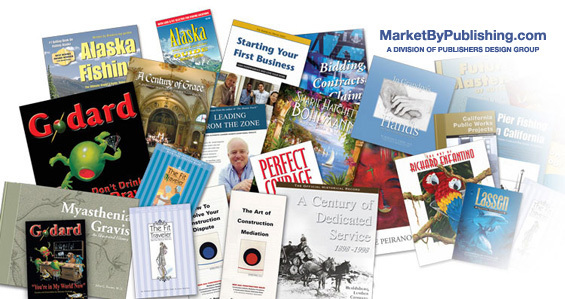 To view samples of MarketByPublishing projects, click here. To view our Marketing & Graphic Design Serivces division, click here.